Key Feature – Dario Meets Ernst Kraft, a Dutch “Master” | Marbella Marbella – Adelante! Key Feature - Dario Meets Ernst Kraft, a Dutch "Master"
I first encountered the works of Dutch artist Ernst Kraft at the Exhibition Room of the University of Malaga in 2001 and I must confess that his paintings “Work on Paper” left me confused, as I could not understand what they were saying, nor the medium he was using, which turned out to be a mix med/paper. Ernst is tall, slim and wiry built, with a polite rather shy personality, with the discernable style of a person of an intellectual disposition. We later met again quite accidentally at the Hotel Tamisa Golf and gradually I began to learn of his extraordinary life and work around the world as well as his two studios in Mijas Pueblo and Malaga. Born in Bloemendaal in 1952, Ernst has lived on the Costa del Sol for over 20 years, mainly in Malaga and Mijas Pueblo. Between 1976 and 1980 he had his Art training in the studio of painter Jacques von Pell in Amsterdam. From 1980 until 1989 he had his own studio in the Centre of Amsterdam at the canal Brouwersgracht and before that between 1971 and 1976 he travelled throughout North and South America. Honorary member of the Cultural Association “Terra Dell´Arte”, Italy. Member of the Iniciative L5, Holland, director of the international Project Din A4 and co-founder of the Asociación Malaga. Ernst’s work is highly regarded in the art world and has many commendations from prestigious centres of contemporary art, too many to publish in this article “… his participation in this fourth Biennale (the Biennale of Contemporary Art of Florence, Cittá di Firenze.) 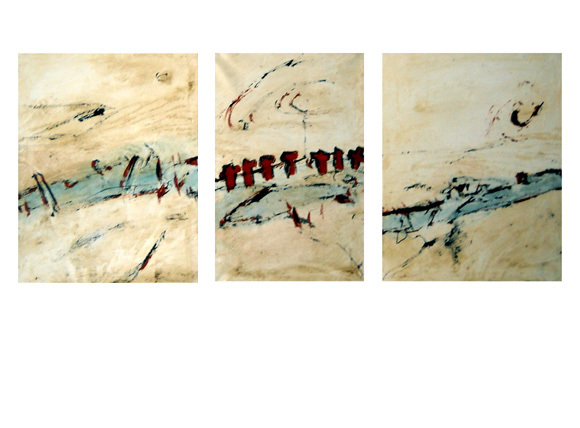 consisted in the show of one triptych, named after Benjamin Britten’s “War Requiem”. The triptych with large dimensions, build up with one central panel and two side panels, shows a twisted landscape of abstract forms. In its composition the side panels with their strong black drawings, seem to guard, like apocalyptical horsemen, the main work. “…a work of gestural expressionism, in which the colour, and the texture are the clear protagonists, using acrylics, resins and tar (alquitrán), which are extended in heavy brush strokes over a double woven canvas…”. should be the source of the writing.” ”At the moment I am working to make my exhibition next month, beginning October in Malaga, and in my spare time I am starting to shape what I will go to do next February in Cuba. I have been invited, to make an exhibition, an installation… in the Art Museum of Trinidad de Cuba. Wonderful.